It doesn’t matter where you observe mold and bacterial growth in your house. All living spaces must be mold free to ensure a clean and hygienic environment for you to breathe in. Today, there are hundreds of products that claim to eliminate mold growth after a single application. The truth is most products contain harmful chemicals and toxic compounds that can harm the health of your children and pets. This reason is why it is important to invest in a product that is labeled safe for long-term use. Although, basements, attics, and bathrooms are susceptible to mold growth; it is not uncommon to notice mold and algae stains on your roof. Removal of stains doesn't have to too expensive. Now that we have a wide range of roof cleaning products to eliminate unpleasant mold and fungi streaks; cleaning your roofs is easier and economical. By using a tested cleaning solution to take care of your roof; you can save thousands of dollars, which you would otherwise spend on hiring professionals. 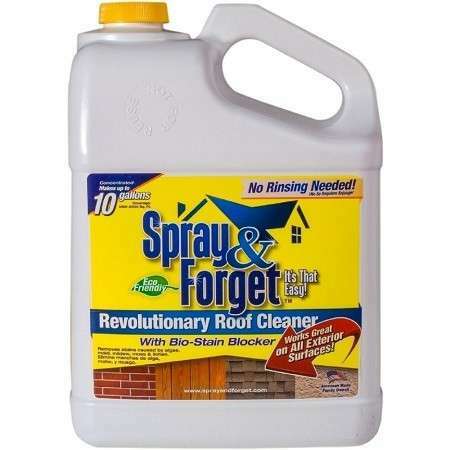 The Revolutionary Spray & Forget Roof Cleaner Concentrate is a fantastic outdoor cleaner to take care of all your roof cleaning needs. The name says it all. Just spray the solution and forget about unwanted mold stains on your roof as well as all other exterior surfaces. One of the best features of this product is that its non-corrosive formula doesn’t require any brushing or power washing methods to take effect. Moreover, it is one of the only few roof cleaning products that do not utilize toxic acids or heavy-duty bleaching elements to suffocate the air you breathe in. Although, countless products offer the same benefits that this Spray & Forget product offers. However, when you compare the results and safety features of this concentrated solution to any conventional product; it is easier to know why this emerges as a clear winner. 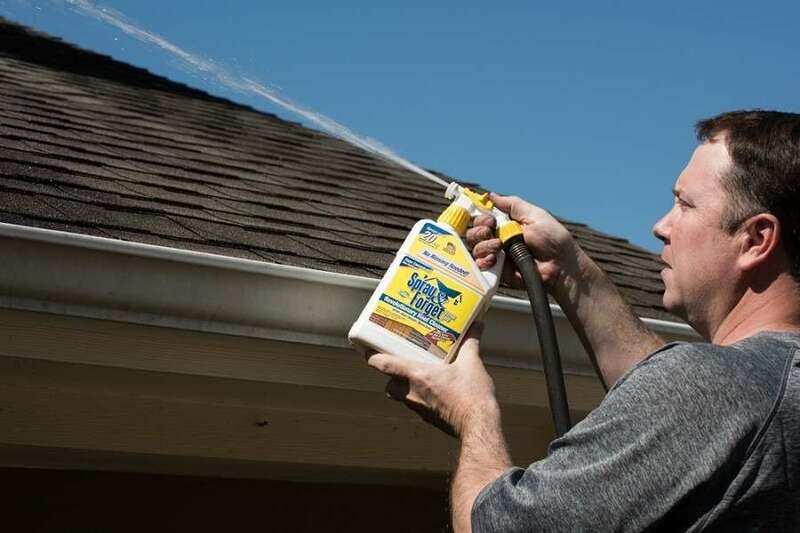 Regular roof cleaning products include bleaching elements only kill the top layer of mold and algae, which means that they can spring right back after you stop using cleaning products. This product produces more effective results and gets the job done professionally. You get a spotless exterior surface for at least 6-9 months after using this miraculous cleaning solution. The 1-gallon bottle is enough to cover extensive applications and is brilliant for use in large areas. Moreover, you don't have to use generous amounts of this solution to clean a surface. Here are a few features and benefits of this amazing roof cleaning solution. ​The Spray & Forget roof cleaner currently ranks as one of the best-concentrated products that miraculously clean the exterior surfaces of your houses without causing any damage. Since there is no rinsing required; you don't have to worry about a complicated application procedure that takes up too much time. The product is engineered to penetrate deep into the stains for dissolving stubborn streaks caused by moss, algae, mildew, and mold. Ideally used for cleaning roofs, you can also use the concentrated solution for cleaning fences, decking, shutters and other exterior surfaces. Thanks to its revolutionary formula, users benefit from a no-bleach composition to guarantee a breathable environment for the application. It goes a long way in saving your maintenance bills and reducing labor work that is involved in professional cleaning services. Nothing goes wrong when you use the Spray & Forget roof cleaning formula. 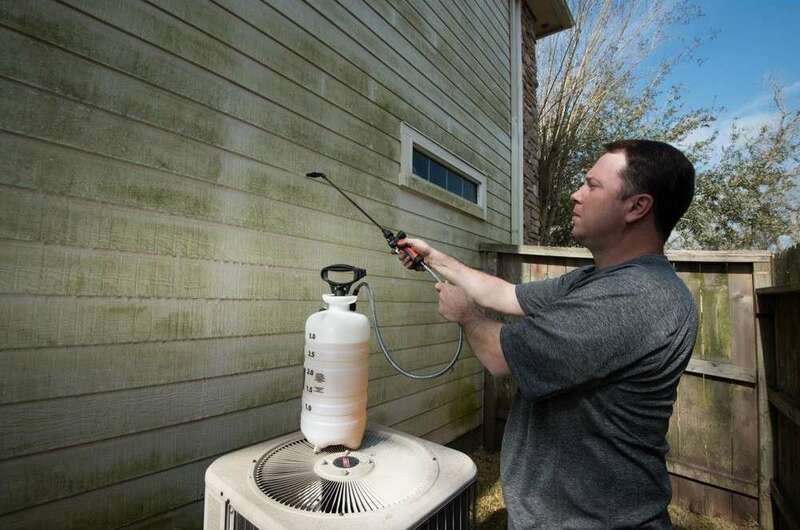 Just do what the brand name says, spray the solution and simply forget about your mold and algae stains on your exteriors. Thanks to its tough formula, users need to use just a small amount to get immediate results. You can use this safe product on any exterior surface you want. This roof cleaning solution comes from Spray & Forget, which is a trusted manufacturer that dominates the industry with its non-toxic products. All stain removing and cleaning solutions from this brand are highly safe to use in all kinds of environments. Customers who invested in the Spray & Forget Roof Cleaning Solution consider it one of the best non-bleach concentrated solutions to tackle stubborn mold stains. It is a highly effective product that does not contain any heavy metals or acids to damage your exterior surfaces. Moreover, users are delighted to accomplish noticeably visible results immediately after the first application. It is a professional-grade product to remove unpleasant algae, mold and other types of stains without causing any harm to your surroundings. You can clean your house and boats without fearing any damage. Although, there are too many roof cleaning solutions available for this price, not any of these products deliver the results you get out of this gem from Spray & Forget. Use this product regularly to safeguard your roof and exterior surfaces from debris, dirt, moss, algae, and mold. If you are looking for a revolutionary method to disinfect your roof along with other exterior surfaces, this no-rinse, and non-corrosive stain remover is a beneficial product. Not only it effectively removes all unwanted spots, but it is also safe to use thanks to its non-toxic composition. Buyers consider it an incredible product to dissolve old and unpleasant stains without compromising your landscaping. It works, unlike any other roof cleaning spray that heavily relies on bleaching elements to remove stains. The Spray & Forget Roof Cleaner is an eco-friendly, non-corrosive and affordable product that does not contain any bleach or phosphates. It is incredibly safe and works for all kinds of exteriors. The solution is manufactured to take care of all kinds stain without damaging your landscaping. You get immediate results right from the first application.